This recipe for crab towers is your answer to the easy to make but super dramatic appetizer or first course. Or for a fancy light lunch! Remember a few days ago when I said the next few weeks on this here website were going to be a mix of super easy recipes and super fancy recipes? Welcome to the fancy part…I give you these very dramatic, very scrumptious, very holiday-colored crab towers! And I know, they LOOK all complicated, but remember this is me you are talking to, and I don’t do complicated. So if you are looking for a show-stopper first course for your holiday table, look no further and let’s make them! 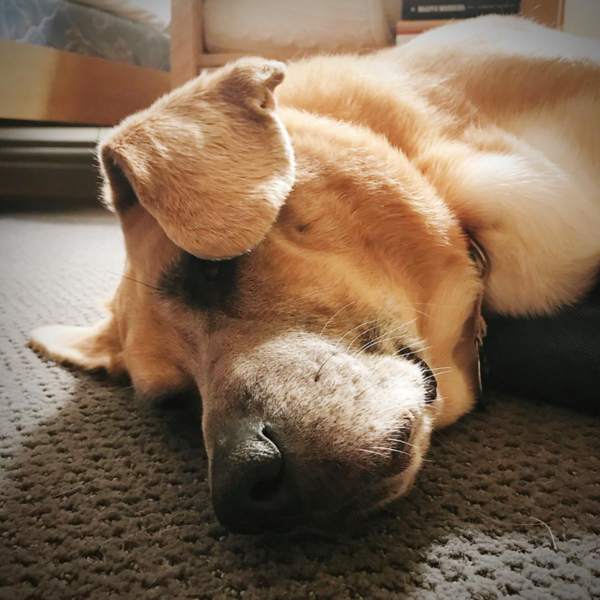 I especially don’t do complicated during the holidays because I have now already spent many days up past by bedtime and with more than a week to go until Christmas I am already feeling like this. So you know my holiday menu is going to be one that combines maximum fanciness with minimum kitchen time. 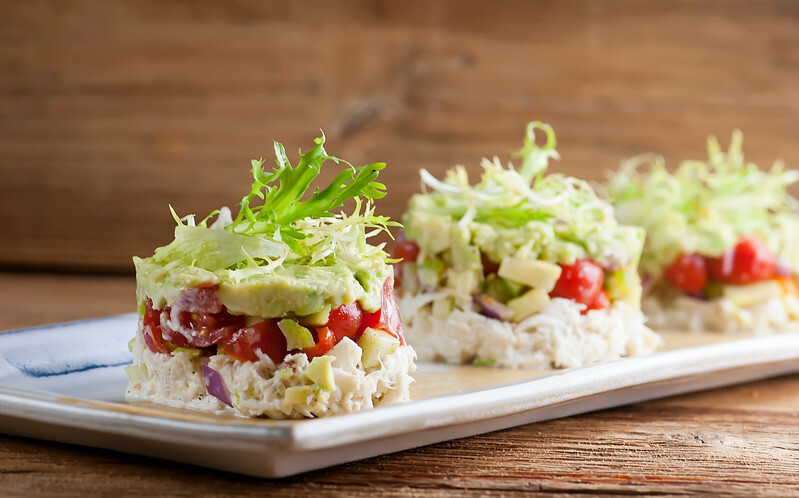 These crab towers are the definition of that…you mix up ingredients for a crabmeat salad, a veggie mixture, and an avocado topping. The only slightly complicated part is making the towers, but even that just takes a little patience and faith! Ideally you will have a 3 inch wide/1 inch high biscuit cutter, but if you don’t the top of a wide mouth mason jar will work perfectly. Put it on a dish and pack it with 1/3 cup of the crabmeat mixture. Raise it up so that it is still covering just the top of the crabmeat and carefully spoon on 1/3 cup of the veggie mixture. One more time with the avocado mixture. Now lift the cutter up and off, and voila! Crab tower! I like to garnish mine with a little frisee lettuce sprig, but that part is up to you. And if by some chance your tower tumbles, I promise you that it is still going to taste glorious. But I’m betting it won’t! Happy fancy holiday cooking, all…I’ll be back in a few days with the Southern daughter’s all time favorite Christmas cookie! Make the crabmeat mixture by combining the olive oil, vinegar and mustard together. Mix three tablespoons of the mustard mixture with the mayo and the lemon zest (save the rest of the mustard mixture for later). Add the crabmeat and mix well. For the vegetable layer, mix all the ingredients for that layer together and set aside. For the avocado layer, mix all the ingredients for that layer together and set aside. To make the layers, put a 3 inch round cookie cutter on a plate (you can also use a large mason jar lid or a well-washed tuna can with the top and bottom cut out). Press 1/3 cup of the crab mixture inside the cookie cutter. Lift it up a little and gently spoon in 1/3 cup of the vegetable layer. Lift it up slightly one more time and add 1/3 cup of the avocado layer. Now lift it up and away gently. Tear the firs lettuce into sprigs and toss with the remaining mustard mixture. Garnish your tower with a sprig of frisee lettuce. This IS fancy! Looks really tasty, too! And if you don’t happen to have a round biscuit cutter or a mason jar ring, you can use an empty tuna can. Wash it, of course, and cut the bottom out with your can opener and, Voila! instant ring mold! Looking forward to the cookie recipe! As always, AWESOME idea! Thank you my friend! What a fun and impressive recipe! Love the unexpected ease with which these towers come together, so perfect for holiday entertaining! Thanks Luci! Hope your holidays are merry ones!